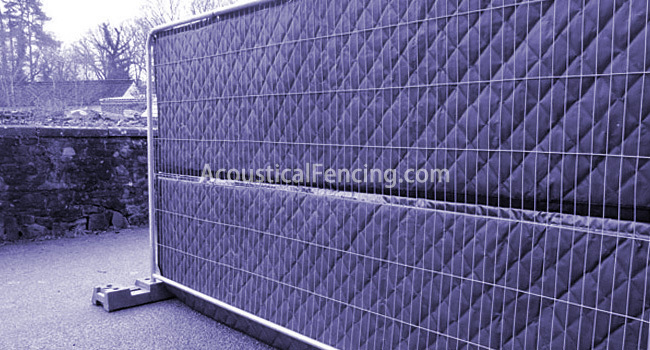 Temporary outdoor fence or sound curtain noise wall is an economical and effective method of reducing noise generated by equipment, pumps, generators or other processes that are outside and are exposed to the elements. This unique composite material combines a sound absorber with a noise barrier into a flexible and versatile panel. Constructed of outdoor rated sound absorber and reinforced vinyl sound barrier, outdoor acoustic barrier can withstand high heat and prolonged UV exposure. The panels can be easily mounted to a new or existing fence structure to create an instant temporary outdoor fence around outdoor chillers, rooftop air handling units, vacuum pump sound reduction, pumps, fans, or as a temporary and reusable construction noise barrier. 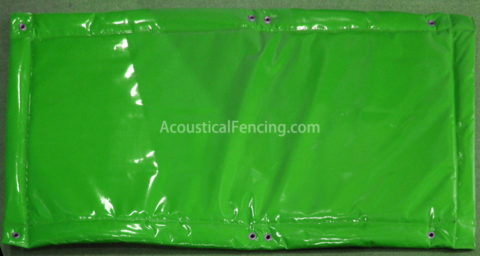 Temporary exterior fence is made of quilted vinyl, vinyl-coated fiberglass cloth, and fiberglass batting. 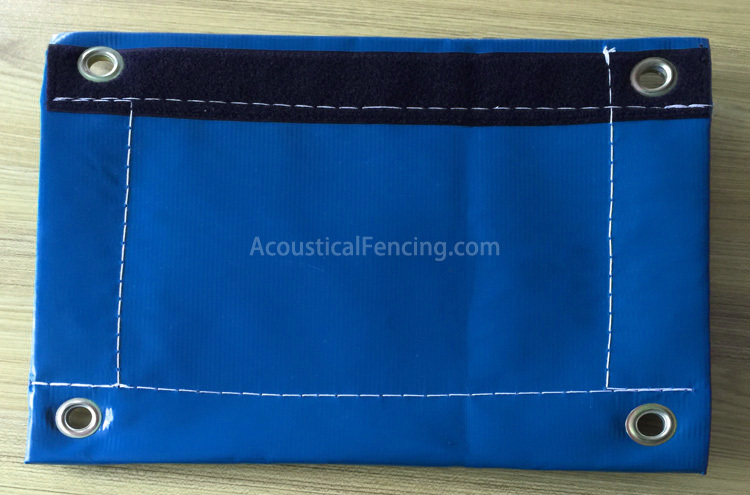 The sound blankets have grommets across the top border so that they can be hung from a hanging track or a floor mounted column. They also feature Velcro fasteners along the vertical edges and are flame resistant. 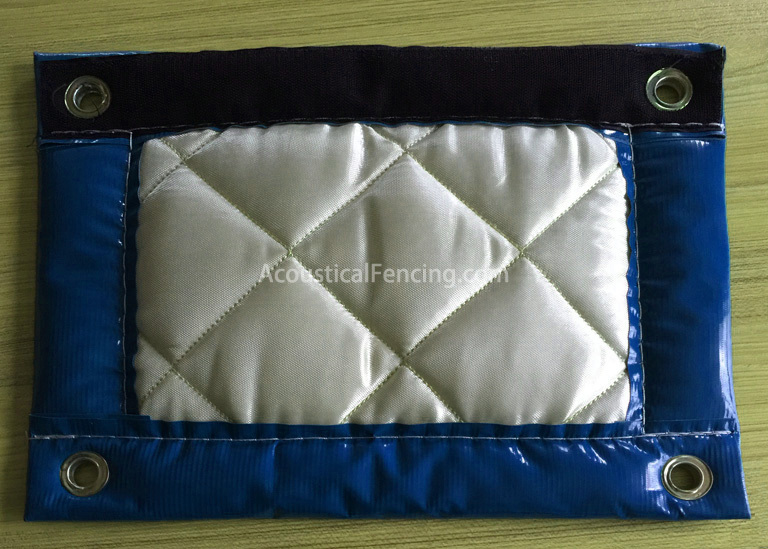 The quilted vinyl-coated panels have many curved surfaces that redirect sound waves so that they are less coherent and are made harmless. The batting in the panels absorb sound waves so that the environment is quieter. They come in different levels of thickness to absorb varying degrees of noise. The temporary external fence can have windows and come in different colors. They can be used as curtain enclosures, partition walls, sliding doors and as acoustical wraps. Not only does temporary outdoor fencing help sites comply with noise ordinances, they also help to reduce hearing loss. Ongoing exposure to loud noise can lead to noise-induced loss of hearing. These acoustical temporary outdoor fences will benefit the worker and anyone who is near the noise pollution. Temporary outdoor fence reduces noise from generators, pumps, and equipment. 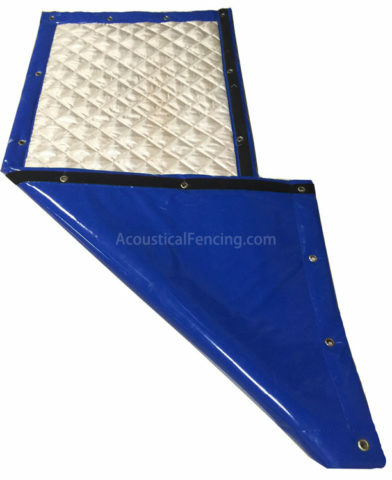 The outdoor acoustic panels are flexible and can be installed on frames, fences, and other types of support. They are seen on the fences of construction sites, by-pass pumps, rooftop barriers, and gas compressors. The panels are modular and versatile. They are able to withstand prolonged UV exposure, high heat and are reusable. Power companies use steel temporary fencing Ireland to reduce noise from a transformer station. Infrastructure improvement projects, such as those using horizontal drilling. Manufacturers can use modular steel acoustical enclosures to make a “quiet room” for performing sound tests on products. Highway construction sites may use sound barriers to block noise from reaching residential neighborhoods. Processing plants can use a temporary outdoor fence enclosure to enclose a hydraulic pump unit. Please contact and let us assist you in designing a system to meet your noise control needs.